A slide is a fun addition to your above-ground pool, but before installing one, you should be aware of the safety concerns and codes that apply. The guidelines for slides in above-ground pools are the same as for in-ground pools. The main difference between the two types is the length of the slide and ladder. Any slide that can fit in your pool and adhere to clearance guidelines is appropriate, unless it explicitly states it is not made for an above-ground pool. A gently sloping slide manufactured specifically for above-ground pools is best. Regulations for pool slides can vary from one state to another. 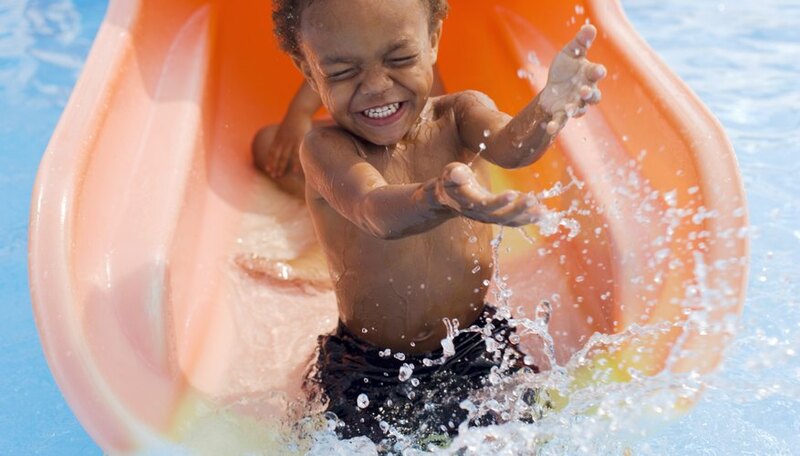 In Illinois, for example, public health codes regulate that the slide should terminate between 6 inches below and 2 inches above the pool surface. Many slides might not fit those guidelines if installed over the rim of an above-ground pool. The most important guidelines are those stated by the manufacturer. Many water slide manufacturers require clearance from the end of the plume, between 10 and 20 feet or more. Always review the clearance and depth requirements for a particular pool slide and ensure that it is made for your type of pool. You should only use a slide for an above-ground pool if the manufacturer explicitly states it is made for such pools. In some cases, the slide might be made for both in-ground and above-ground pools with a deck. Select a product with a more compact ladder and gentle chute if you have an above-ground pool deck. Without a deck, select a slide constructed with a large enough ladder to aid in reaching the elevated pool rim. But keep in mind that you cannot use one of these approved slides for your pool unless it meets clearance and depth requirements. Some slides might also require a pump system in your pool when they incorporate water jets. Pool slides can be dangerous, especially when used or installed incorrectly. A common cause of injury is using the slide head-first. Always go feet-first, especially if you are dealing with a pool of shallow depth. Place the slide in the deepest part of the pool. Allow the required clearance around the sides of the slide, which can vary by manufacturer. Many slides need 3 1/2 feet of more of clearance away from the crossfire of other pool additions and slides. Install your pool slide according to manufacturer instructions. if your above-ground pool has a deck, the steps should be installed securely to that deck. If it does not have a deck, install the steps to the ground as directed. Ensure that the chute adheres to all the required clearances and depths as stated in the instruction manual. Adjust the stair height if possible and necessary.